All visuals are temporary, only the cover, the game board and the stickers are in an advanced stage. The other elements are those of the tests. 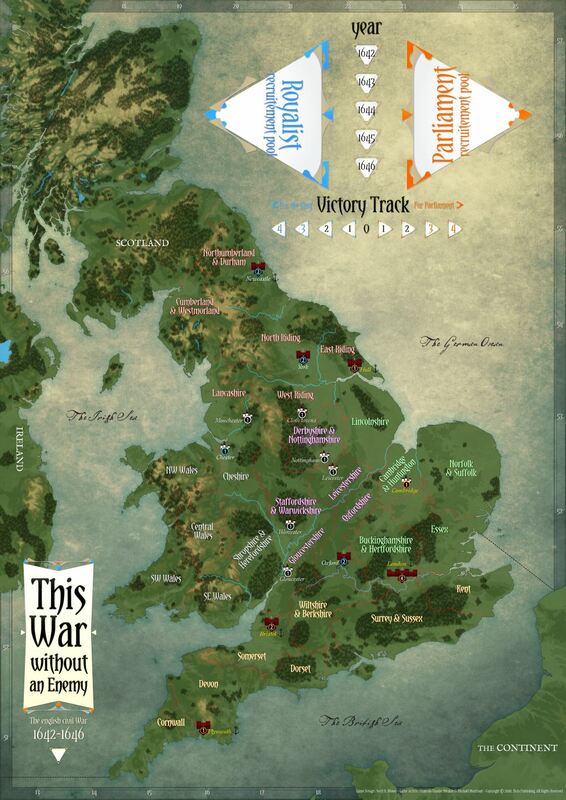 This War Without an Enemy is a 2-player strategic block wargame on the first English Civil War, during which the Royalist forces fighting for King Charles I were opposed by the English Parliamentarian troops and their Scottish allies, the Covenanters, in a struggle for political, economic and religious control of England. - Initiative Phase: each player plays a card to determine player order for the Strategic Phase. - Strategic Phase: each player, in turn, spends the action points on the card they played to move blocks and/or recruit (deploy new blocks or add strength to existing blocks). - Tactical Phase: battles and siege combats are fought. - Supply Phase: blocks exceeding the supply limit of an area are reduced in strength. - Victory Phase: if the marker on the Victory Track has reached 3 or more VPs for a player’s side, then that player has won the game. The game map depicts England and Wales, the scene of the conflict, split into five Regions and further divided into Areas, as well as parts of Scotland, Ireland and ‘Le Continent’, from which other forces may enter the war. New troops that can be raised in England and Wales are represented by blocks kept in the Recruitment Areas. Blocks that enter the game through major events or through card play remain off map. The blocks are coloured blue for the Royalists, orange for the Parliamentarians and green for their Covenanter allies. Each block has a Tactical Rating, consisting of its class – Artillery (A), Cavalry (C) or Infantry (I) – and an effectiveness from 1 to 3. Most of the blocks have a designation showing their home Region, which places restrictions on their movement and ability to recruit. The most important generals are represented by their own blocks, and are either Leaders (L) or Regional Leaders (R), with the ability to take Regional blocks out of their home Region. There is a deck of cards for each player. Every card has a number, from 2 to 4, which is the amount of Action Points it provides. 2- and 3-AP cards also have an event, described in the text, which can be activated in a specific phase. Some cards are removed from the decks at the end of a year, and other cards are added to the deck. Battles are resolved on the Battle Mat. This helps players to keep track of the timing of the battle and the interaction between the blocks. There are different sections for each class of block, as well as for reserves and for off-battlefield cavalry. 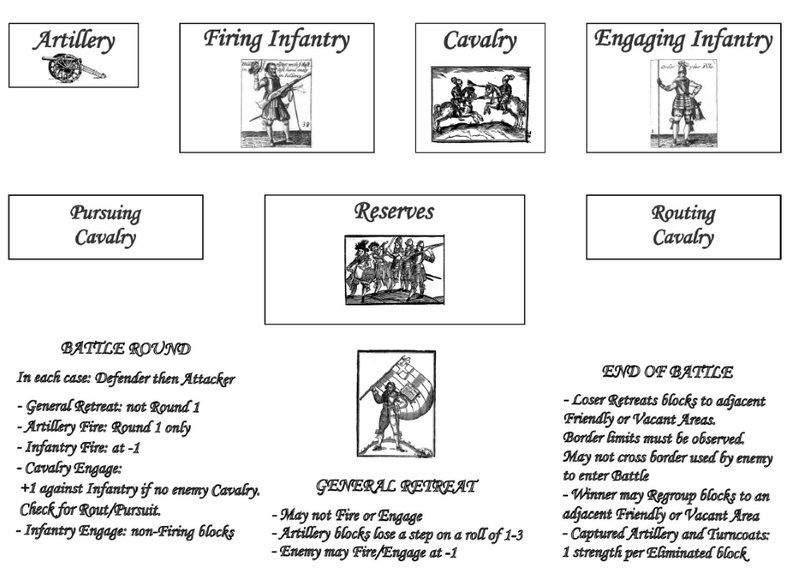 There are specific rules for each class of block that reflect the use of the different types of soldier on the mid-17th century battlefield. This War Without an Enemy includes five scenarios. The three longer scenarios end either with a player reaching 3 VPs or at the end of 1646. - The Full War: up to 26 turns. This starts with the king’s main army mustered in and around Shrewsbury and the earl of Essex heading towards Worcester with Parliament’s army. Smaller regional forces are scattered through the north, the midlands, Wales and the south-west. The Royalists begin with better quality troops and a higher proportion of cavalry, whereas the Parliamentarians have the advantage of possessing London. Can the Royalist player achieve a quick victory before the Scots enter the war? Will the Parliamentarians hold on until the New Model Army turns the tide? - The Early War: 8 turns. This introductory scenario last until the end of 1643. 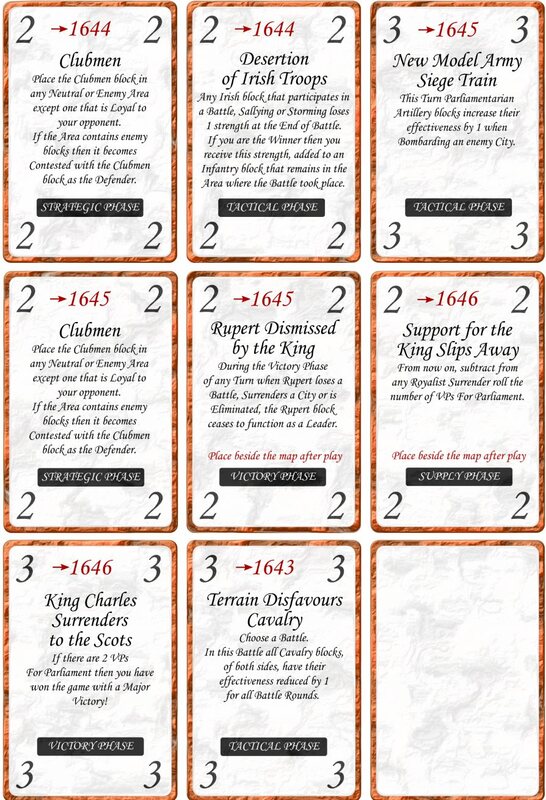 The Royalist player must match the historical performance of the Royalist to win. - The Mid-to-Late War: up to 18 turns. 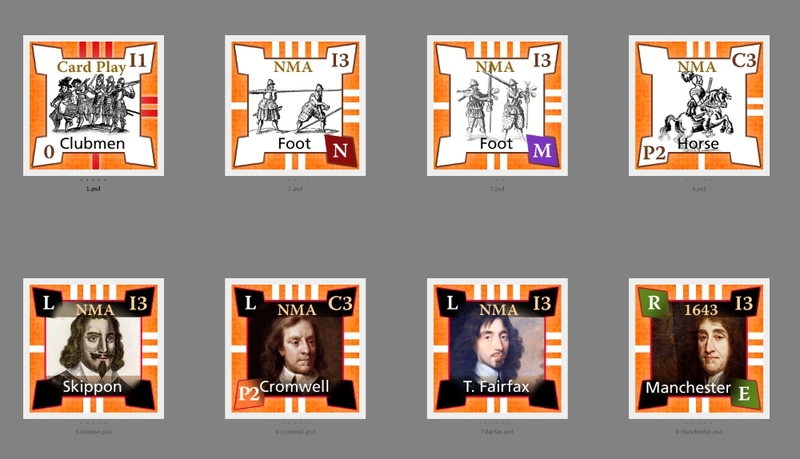 This scenario takes up the action at the beginning of the 1644 campaigning season. The Royalists have captured Oxford and Bristol and dominate the north. But the Covenanter army is poised in Scotland, ready to the cross the border south to aid their Parliamentarian allies. - The Mid War: 6 turns. This introductory scenario covers 1644 only. The Parliamentarian player must match the historical performance of the Parliamentarians to win. - Prelude to War: up to 27 turns. 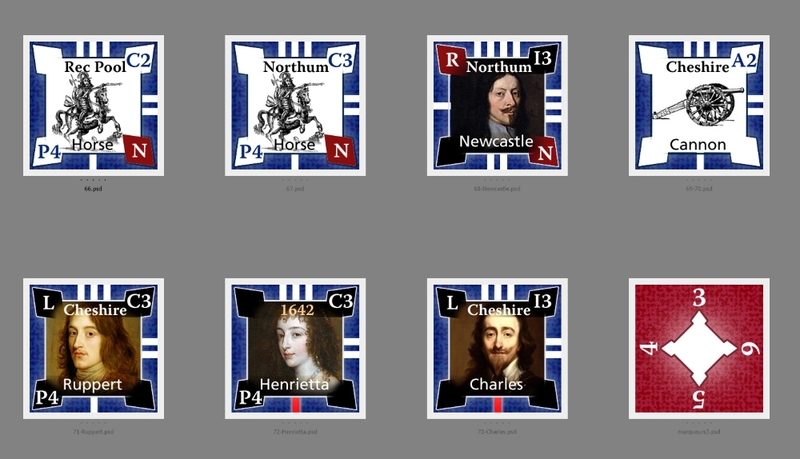 This scenario begins in June 1642, during the run up to the war, with the king trying to raise recruits in Yorkshire. The scenario offers players the opportunity to move away from the scripted starts of the Full War scenario by choosing where to raise their initial forces and how to concentrate them before the war begins in earnest. Les Guerres Picrocholines – The Picrocholine Wars Adapted from Gargantua by François Rabe..